Installation View of Michael Heizer at Le Bourget, 2018. Pictured: Cilia, 19681990. Artwork © Michael Heizer. Photo: Thomas Lannes. Courtesy Gagosian. 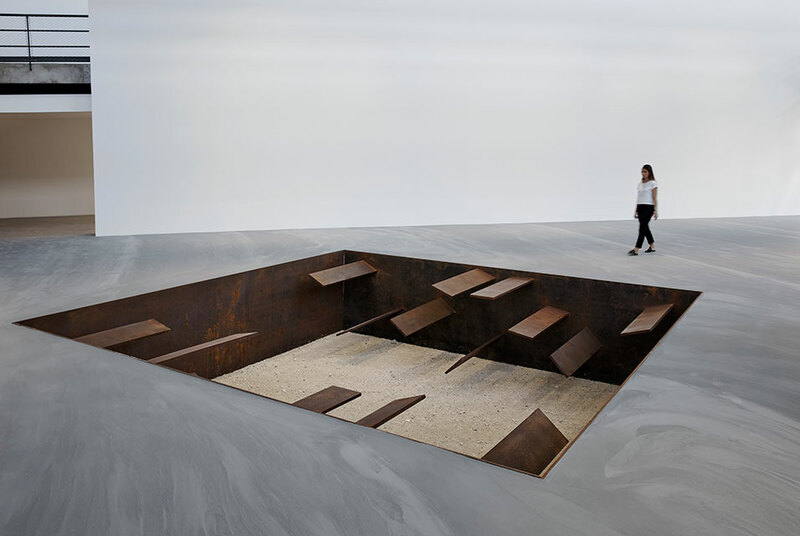 PARIS.- Gagosian is presenting works by Michael Heizer, dating from 1968 to the present. As a young artist in New York in the 1960s, Heizer began making displacement paintings, geometric canvases in light and dark tones. In the winter of 1967, in the Sierra Nevada mountains, he excavated several chasms in the earth, adapting the New York paintings to three dimensions. These un-sculptures, or sculptures in reverse, became the basis of a new sculptural vocabulary, as Heizer began using the land, and its removal, as his media. In the summer of 1968, Heizer installed Ciliata and Slot Mass on the California-Nevada border. Ciliata, a rectangular volume of hollowed-out earth, contained jutting wooden protuberances like the cilia of a cell. The adjacent Slot Mass comprised parallel descending tracks cut into the ground. The negative forms undergirded a rock that rested on their deepest end. Slot Mass was the precursor of Levitated Mass, a sculpture Heizer originally attempted to make in 1969; a larger version of Levitated Mass was permanently installed in 2012 at the Los Angeles County Museum of Art. Both Ciliata and Slot Mass were built with wood and earth, and intended to degrade. Permanent steel versions of both, titled Cilia (196890) and Slot Mass (19682017), are on public view for the first time at Gagosian Paris, in the identical configuration to 1968. Scoria Negative Wall Sculpture (2016), a mass of dark vesicular rock tightly encased in a deep steel frame, is set into an adjoining gallery wall, reproducing the positive/negative configuration of Heizers Displaced/Replaced Mass (1969). The exhibition includes three paintings from the 1970s, in geometric shapes and dark and light tones. A triptych of paintings from 2017, (Untitled), will be shown for the first time. The curved canvases are related to the earlier Munich Optical Paintings from 1972, and to the 1969 Munich Depression sculpture. The diagrammatic forms of the recent paintings echo the suggestion, present in the earlier works, of seeing beyond visions periphery. Vitrines installed in an ante-gallery contain archival materials from Heizers files, including original painting studies. Given that the first iterations of Heizers works of the late 1960s were conceived as temporary installations and subsequently deteriorated, they now exist only in photographs and preparatory sketches. Serving as contextual material to Heizers monumental body of work, these documents shed light on the evolution of a unique American artist, from the early desert excavations to the ongoing project of Heizers City (1970), a vast sculpture in the desert of central Nevada, now nearly fifty years in the making. The exhibition is on view at Gagosian Le Bourget (Paris) until February 2, 2019.